At least six people were killed and four were injured today in a bomb attack at the site of the Great Pyramid of Giza, one of the country’s most popular tourist attractions. All of the deceased are believed to be Egyptian police and administrative officers that were stationed close to the pyramid. No confirmed foreign casualties have been reported. The explosion was caused by a bomb placed in a garbage can outside a mosque on Pyramids road which is the main avenue leading from the city center to the pyramids. It is believed that the police were the target of the attack. 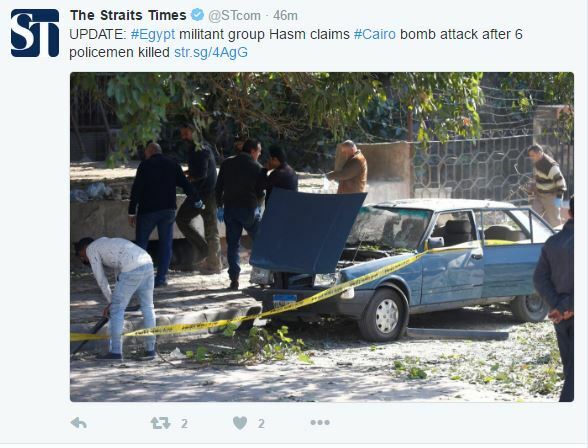 An emerging Egyptian terrorist group, called the Hasm Movement, has taken responsibility for the attack. It is believed that the bombing is a response to a police raid on Tuesday that killed three armed members of the Hasm Movement at a hideout in southern Egypt. This is one of many recent attacks on police by terrorist organizations in Egypt in the past year. In May, armed militants fired on a bus filled with plain clothes officers in a suburb of Cairo, killing eight officers. In October, a police convoy in Cairo was hit by an Improved Explosive Device (IED). There have also been a series of smaller shootings and grenade attacks carried out against Egyptian police.